For all we know, Jimi Hendrix may have been from another planet; there was no one like him before, and hasn't been anyone like him since. 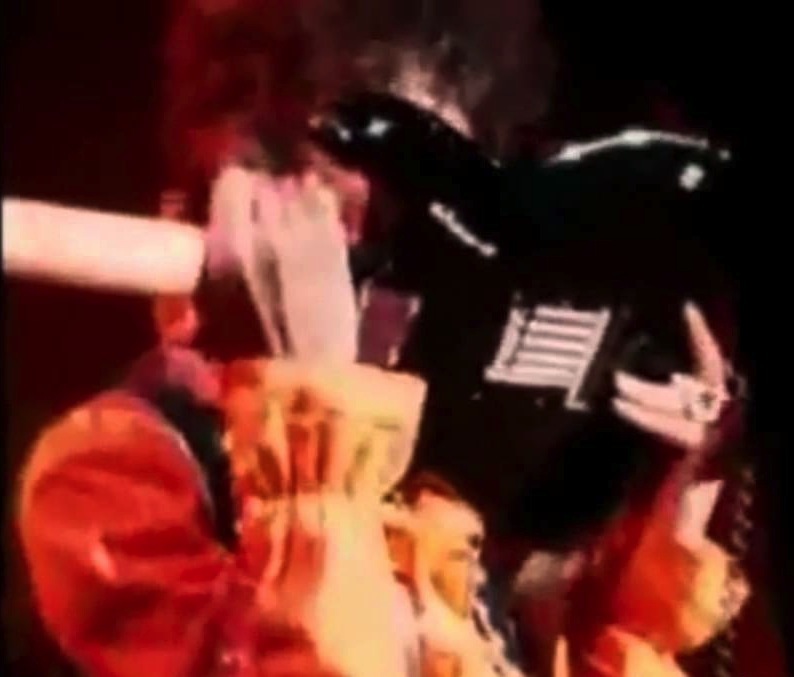 While many guitarists have unique tones, I reckon that Jimi's playing technique might be the most recognizable of all, with his quirky double-string bends, unique chord-melody style, and incredible use of the whammy bar and volume knob with his fuzz pedals. 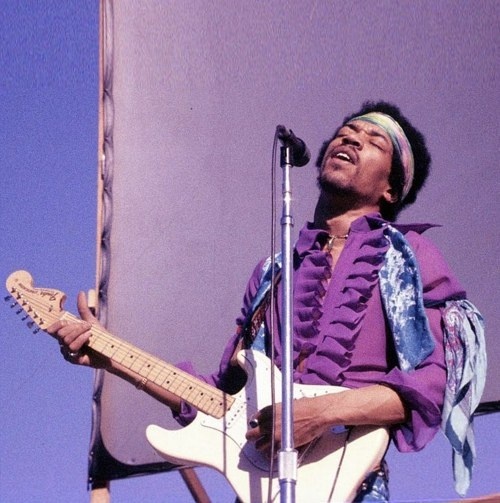 By all accounts, particularly that of Eric Clapton in his autobiography, Jimi was an unassuming genius, possessing the technical ability of someone who practiced incessantly, yet never acted like it was a big deal at all; it was just something that flowed so naturally, it seemed effortless, almost embarrassing him. Of course, that coy shyness disappeared when he went on stage, and a larger-than-life flamboyance as bold as his love for music exploded like a supernova, enrapturing anyone in sight. I'd always chalked up the tangible aspects of Jimi's technique to his large hands, as he was described by many as having the hands of a basketball player; I need two fingers for some of those double-string bends that he did with just one, and the thumb-over-the-top chording style is crucial to many of his tunes as well. Aside from stretching a bit, we can't enlarge our hands, but after doing a bit of research, a few things jumped out at me that I felt were worthy of mention here, and hope they help others as much as they've helped me. The most obvious difference between Hendrix and everyone else is the trademark righty-Strat-turned-upside-down; he may have done this out of necessity at first, as lefty instruments were incredibly rare at the time, but even later on when he could afford to custom order a lefty from Fender, he chose not to. Restringing a Strat and flipping it over has some residual effects which certainly played into Jimi's signature sound, as i'm certain he and equipment tech Roger Mayer understood. First, and foremost in my opinion, is the string tension; with the headstock now reversed, the low E (actually Eb) is now the longest string, giving it a slightly looser feel, while the tension tightens gradually as we move higher up, string by string. Contrary to how it sounds, this actually allows for easier bending on the two highest strings, as they don't have to be bent as far to reach a half or whole step in pitch now. Combine this with tuning an already light set of strings down a half step, and Jimi could bend to Mars and back for days. 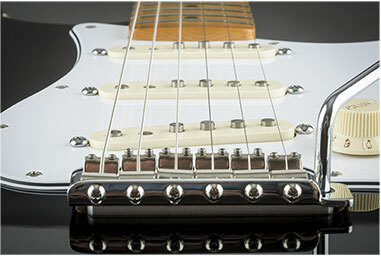 To begin talking about string gauge, we have to understand a few basic concepts: plain steel strings generate a stronger magnetic output than nickel-wound strings, and in the early days of electric guitar, a typical set of strings included a wound G. As Fender fretboards were curved at a radius of 7.25", the pickup pole pieces were set to compensate for this, with the G and D poles raised highest, and the low A and E following the radius curve downward. The treble side didn't follow this pattern though, as both pole pieces were lowered almost flush to compensate for the stronger magnetic field of the plain strings, with the B slightly lower than the high E to make up for the difference in thickness. Now, take everything I just said and flip it around; Jimi didn't reverse the pickup orientation when he restrung his Strats, so the pole pieces for the higher strings are now underneath the lower strings, and vice versa, providing a weaker magnetic field on the bass side and slightly stronger output on the treble side. Pickup polepieces on a standard Strat (left), compared to the reversed pickups of a Hendrix Strat (right). As lighter string sets with plain unwound Gs became popular (originally by guitarists using two high-Es for both B and E strings, and shifting the rest of the set down by one, as Jimi did initially), the plain Gs combined with the raised pole pieces to create G-heavy imbalances in pickup output. Enter Roger Mayer, who believed that the electrical output of the strings could be determined by squaring the diameter of each string and matching them accordingly. In a Guitar World interview, Mayer stated that "Many times people use a set of strings that are completely imbalanced and they just don't sound that good. Most people would say a .010 to .013 is the correct jump. And the .015 is much better for the G than a .017. An .015 squares out at .225 and .017 is .289. So you're going to get 28 percent more output just with a two-pound different in string size." (as I'm no physics engineer or mathematician, I'll take his word for it, just as Jimi did). The lighter G surely helped in dealing with the raised pole pieces, and Jimi's string set was .010, .013, .015, .026, .032 and .038, according to Mayer (also a popular Fender set in the late 60s). Maybe most importantly, the slant of the bridge pickup is now 1/2" away from the bridge on the treble side, allowing those higher strings to bloom a touch more, while picking up the bass strings 1/2" closer to the bridge for a brighter, more biting tone. Combine this with the flipped pole pieces, and you've got a whole new world to explore in this position, resulting in tighter, clearer bass notes and warmer, fuller highs. Seymour Duncan has recently offered a loaded Hendrix "Voodoo" pickguard (no relation), covering both of these important pickup variations. Another factor that gets little discussion yet is extremely important (in my opinion) is that of the electronics cavity now being on the bass side of the instrument, as opposed to it's usual orientation on the treble side. That massive hollow cutout may not typically effect the higher strings much, but on the bass side, the heavier Eb and Ab would certainly resonate more in that space, especially combined with their now-longer scale length from bridge to tuning peg, resulting in an increase of harmonic overtone resonance and an almost semi-hollow quality. Of course, the only way to simulate this would be to take a lefty Strat and flip it righty, or find the 1997 Hendrix "Mirror" Strat, which did not sell particularly well and was discontinued after one year. A point can be made about the neck pocket now making more of a connection on the treble side rather than the bass side; I believe this may be a slight detriment, if anything, as the bass strings might benefit more from the extra wood contact and resonance, but ultimately the heel joint itself is the most critical point of transference in a bolt-on instrument, and that remains the same. The not-so-popular Fender Hendrix "Mirror" Strat, which may have gotten everything right in the first place. Lastly, a quick look at Jimi's tremolo and bridge setup... he routinely used 4 or 5 springs to keep the bridge pulled back as tightly as possible against the body, with no room to pull "up" on the bar at all, and a lot of tension to fight when diving downward. The bar itself was bent at such an angle that he could pick the strings while easily manipulating it, leading to some very cool vibrato effects like the very end of "Machine Gun" from Band of Gypsys. After trying the left-handed tremolo on an SRV signature Strat, I completely understand how having the bar on the top of the bridge can lend itself to some creative playing ideas while picking, but can be hazardous to long-sleeve shirts, also. Stories vary about Jimi's string height, from Jeff Beck's claim that it was the highest action he'd ever seen and barely playable by anyone else, to super-slinky and low on his Woodstock Strat, to medium-low and comfortable on the last Strat he ever played... as this is more personal preference than anything else, i'd aim for high enough action for clean fretting and avoiding whammy fret-flap (aside from the most extreme of divebombs), while not killing your hands otherwise. Getting the action just right so you can catch two strings in a bend is my personal setup, and for my fingers, that's about 5/64" at the 12th fret. Personally, I've tried a reverse headstock neck on a Strat, and agree that the feel is quite different, although I haven't tried the customized string gauges or flipped the pickups yet. The newer Fender Jimi Hendrix Strat, modeled after his '68 Olympic white Woodstock guitar, combines the reverse headstock with flipped pickups (I kinda wish they had flipped the tremolo too), and i'm curious to try one soon. Recently, Jeff Beck has adopted the reverse headstock on his Strats for the same reasons of string tension and feel, sighting his reignited love of Hendrix as the inspiration. The reality is, none of us have Jimi's hands, mind, or soul, the most crucial elements of his sound... but that doesn't mean we can't try to capture everything else. those gauges are the now discontinued fender original sets. i read that leo liked them for the even tension on strat whammys. i'd been using them since '75 with tele's for the reason you stated, quieter g + low e on flat pole bridge pup (took a lucky shot try). i'm still pissed they stopped making them a few years back. one factor you seem to have forgotten is Jimi used like a 100ft. cable which contributed to his sound A LOT. I didn't realize that, good to know!! Thanks! The bugera v22 infinium is a guitar amp that is significantly underpriced. This is not our opinion in any way. We are just reverberating what countless satisfied customers say. Learn how to become a more successful guitar teacher. Most teachers make the same kinds of mistakes in their approach to building their guitar teaching business. Read this article to learn how to avoid these mistakes. www.mcaccountguides.org I am looking for and I love to post a comment that "The content of your post is awesome" Great work!